PRAYER IS working together with God to fulfill His plan on the earth. And we, the Church, are to be participators, not spectators. We are called to partner with the Holy Spirit and the Lord Jesus Christ. Mark 16:20 says that the disciples went everywhere preaching the Word, the Lord working with them. Likewise, we are to work with Jesus. Effective prayer is a subject that needs to be taught. In Luke 11:1 it says, "And it came to pass, that, as he was praying in a certain place, when he ceased, one of his disciples said unto him, Lord, teach us to pray, as John also taught his disciples." The disciples watched Jesus pray. Notice that they didn't ask Him to teach them how to do miracles, heal the sick, cast out demons, or preach. The disciples understood that whatever took place in prayer with Jesus was the secret to preaching, teaching, healing, and casting out demons. What they observed impacted them so much that they asked Him to teach them to pray. 13 And do not lead us into temptation, but You must now rescue us from the evil one. JESUS WASN'T TELLING THEM WHAT TO PRAY; HE WAS SHOWING THEM HOW TO PRAY. They watched Him pray to the Father in this manner and realized that He had authority and power they didn't have. He was showing them that the way to pray is with an urgent demand on the will of God. The Lord's Prayer is also recorded in Luke chapter 11. In Luke, after Jesus taught the disciples how to pray, He continued with a story. One definition of importunity is "the quality of being offensively bold." It's time for us to be offensively bold in our praying. The blood of Jesus gives us boldness to go before God's throne of mercy and grace. Our responsibility is take the will of God in Heaven and implement it on the earth. Jesus gave the disciples another illustration of prayer in Luke chapter 18. 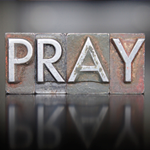 The point of the parable is that we should not stop praying. Interestingly, Jesus uses a legal situation to define prayer. There's a judge, an adversary (the prosecutor), and a widow who is petitioning the judge to appeal her case. Our adversary—the devil—opposes our rights and our righteousness to steal them from us. But we have a Just Judge who is looking for those who will come before Him and plead their rights against the adversary. THE BLOOD OF JESUS IS WHAT ENFORCES OUR RIGHTS AND GIVES US ACCESS INTO THE COURTROOM. Therefore we can stand confidently before the Judge of Heaven and believe for our prayers to be heard and answered. We also have an advocate—the Holy Spirit. In a courtroom setting, the adversary would be the prosecutor who brings charges. The advocate is the opposite of the prosecutor. He is the attorney who defends us. Great news! THE SYSTEM IS RIGGED BECAUSE THE JUDGE IS OUR HEAVENLY FATHER. Jesus and the Holy Spirit are our attorneys. What a legal team we have on our side! So in the court of Heaven—whether we're praying for our individual needs, our family, our nation, or whatever the situation—we are pleading the rights of those involved. And those rights are based on the will of God in Heaven. God is calling each of us to a place of prayer. He wants us to take an active role in executing the will of Heaven on the earth. The realm of prayer is the primary place that God has given the Church to exercise authority. We must take our place and quit yielding territory to the enemy. God is waiting on us to go before Him and say, "In the Name of Jesus, Your will must come into this situation!" Don't let the enemy and his false accusations of sin, weaknesses, and failure keep you from going boldly to the throne of grace. Put your faith in the blood of Jesus and pray earnestly. There are things designed in Heaven that will never take place on the earth unless the Church prays. Each one of us has an assignment, and we need to get busy. Let's get back to the seat of authority and take our place in prayer.